The ancient folklores of the Indus Valley and Sumer speak of their culture-bearing ancestors arriving from out of the Indian Ocean [or ‘Samundra’ as it is called in ancient Brahaman Sanscrit], at the dawn of history. India’s sacred book, the Rig Veda, written between 5000-4000 BC, speaks of these culture-bearers as having arrived from a great land far across the [Indian] Ocean called Aryanam Veijo. ‘Veijo’ means ‘Seed’ and ‘Aryanam’ ‘Aryans’, thus “Seed of the Aryans”. It was to them the land of origin of the Aryans. Similarly the Persians called it “Azer-Baijan”, or the “seed place of the Azar people”, the people who worship fire; locating it in the southern hemisphere. Azer-Baijan survives as the name of modern Armenia. nearby shoreline sites. Photo © Rex Gilroy 2004. And according to Babylonian mythology, the deity Ea, the god of fertilising and creative waters produced a son, Marduk, who created the [southern] Paradise by laying a reed upon the face of the waters, then formed dust and poured it out beside the reed to create the first humans. The water-worshippers of Eridu believed that the Sun and Moon, which rose from the primordial deep, had their origins in the everlasting fire in Ea’s domain at the bottom of the sea; ie the ‘Underworld’ Paradise of Uru. Berosus of Caldea [270-230 BC] described a race of monster beings, half-men and half-fish which, led by a great culture-bearer Oannes, arrived on the shores of the Persian Gulf, to introduce the arts of agriculture, writing and metalworking to Mesopotamia. In other words, they were skilled mariners; gods who introduced civilisation to Mesopotamia and the rest of mankind. The spread of Uruan culture by watercraft to Mesopotamia and India could be called the first great maritime expansion. If so, then the rise of Sumer around 3800 BC saw another which spread Sumerian/Uruan influence to the Indus Valley and Persia; to Egypt and Greece; their vessels eventually penetrating beyond Southeast Asia into the West Pacific to ‘re-discover’ their “land of origin”, the mysterious land of Uru. Learning of its vast natural wealth, the god-kings of Sumer dispatched large fleets of ships, loaded with settlers and supplies, to establish mining colonies here of long duration. Historians credit the Sumerians with the invention of bronze and metallurgy, yet this may have been developed in south-east Asia at an earlier period by megalithic people who claimed a southern origin for their culture. To date, no evidence has been found in Australia to show the Uru had created this art here, although at a few megalithic sites in New England and central western NSW, regions rich in gold, copper, silver, tin and other precious metals, fragments of flattened copper have been found, possibly the remains of crude cutting tools, made by having been beaten cold prior to sharpening around the edges; suggesting the Uru were on the threshold of metallurgy, as the age of smelting was dawning in the Old World. It would be left to the arrival of Old World mineral-seeking colonists to instruct them in these techniques as the age of Uru faded. Metal became important to ancient industry during the early stages of the third millennium BC. Prior to this copper tools had been in general use for several thousand years throughout the Old World. Yet copper was too soft. Sumerian metallurgists eventually discovered through experiment that, alloyed with varying amounts of tin [about ten per cent] tools of this mixture were more rigid and sharper, and weapons and armour were stronger. However, as no minerals were to be found in the flood plains of the Tigris and Euphrates rivers, from the 4th millennium BC, to their destruction by the Amorites in 1930 BC, the rulers of Sumer, followed by those of India, dispatched large fleets into the world’s oceans in search of them, especially into Australasian waters. Traces of ancient mining activity shows they found good quantities of tin in island Southeast Asia. There is also evidence that they mined tin, copper and gold in West Irian and also the North-West Kimberley region of Western Australia, which would come to be known as ‘Arali’, meaning “basement” of the earth, the ‘Underworld’, and “place of the shining lodes” in reference to the great amount of silver mined there. It also became known as “the land from which the metal ores come”. Ancient Sumerian traditions speak of their colonists having overpowered the local [Uru and Aboriginal] inhabitants, and enslaving them to work in the mining operations. My book, “Pyramids in the Pacific” gives a full account of Bronze-Age Sumerian presence in Australia, and its eventual demise due to the collapse of their civilisation at home. However, other sails were appearing on the horizon as the Bronze Age [2000-1400 BC] began, and soon Phoenicians, Celts, Libyans and Egyptians would have an even greater impact upon the Uruan civilisation. indigenous Uruan culture, and they certainly left their influence upon the culture of our Aboriginal people over a wide area of the continent. Note the causeway that extends from left of picture. the pyramid being on the edge of the former harbour. 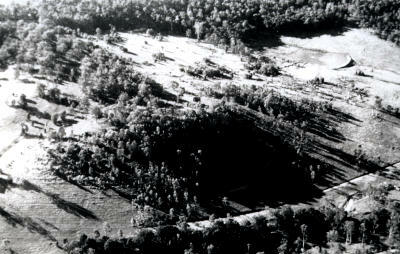 At Gympie, north of Brisbane, in October 1975 I identified a crumbling, tree-covered, terraced 60 m tall by 125 m square, four-sided stone structure as a step pyramid, reminiscent of those built in Egypt during the 3rd dynasty period, from about 2650 BC to the 4th dynasty about 2720 BC, when the step formation was superceded by the true pyramid design. The late Mrs Ethel Loughman, then 73 years old, informed us that 19th century settlers had found a shaft that dropped down deep into the ground, and from which a stone-lined tunnel continued on deep into the structure from the western side. Some locals tried to penetrate it without success. The shaft was eventually filled in to prevent children or livestock falling into it. The “Gympie Pyramid” as I named it, faced the four points of the compass. 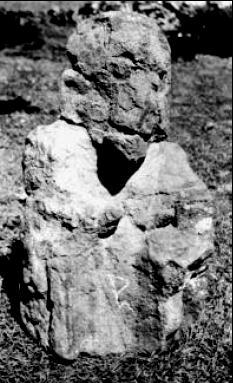 In March 1976, near the structure’s western base, I unearthed a 34cm long by 15.5cm wide crude ironstone idol. It resembled others from Egypt of the god Thoth in ape form clutching the Tau, of “Cross of Life”. It was not the first Thoth ‘ape’ idol to be found hereabouts. Ten years earlier, in 1966, farmer Dal K Berry [since deceased], while ploughing his field, one day unearthed a 72cm tall by 120cm circumference ironstone idol within sight of the pyramid. by the late Dal K. Berry in 1966. The idol was later identified by me as the god Thoth [inventor of writing] in ape form. Carved between the legs was the papyrus flower symbol, denoting Thoth as the god of writing and knowledge. Thoth was depicted as an ape prior to around 1000 BC, when he became an Ibis-headed, human-bodied deity, who recorded the judgement of the dead in Amenti, the afterworld. early settlers and miners discovered ancient open-cut gold and copper mining operations and crumbling large stone structures in the nearby mountains, which showed the district had been settled and mined in the dim past. Geological evidence shows that, at the time the pyramid was constructed, a great harbour extended from Tin Can Bay, 36 miles [approx 24km] to the east, through Gympie and far out into now open farmland. The pyramid stood on the northern shoreline of this wide, deep harbour. Aboriginal traditions of the area state that, in the long-ago“Dreamtime”, a race of fair-skinned“culture-heroes” sailed into Gympie in big ships shaped like birds - suggestive of the old Phoenician triremes, which often possessed bird-headed prows among other figureheads. These culture-heroes spent a considerable period of time in the area, during which they built the “sacred mountain” in which a great chieftain lived, and from which they worshipped the Sun and Stars. They also dug holes in the hills and removed the rocks which they transported out to sea. Eventually they sailed away, promising to return. How else could primitive Aborigines have described ancient mining operations? 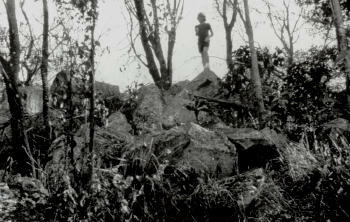 The evidence suggests Gympie was once the scene of a joint Egyptian-Phoenician mining colony.The local tribespeople regarded the pyramid with awe, believing it to be a very sacred place, for their Supreme Being, the Sun-God Biame, lived on the summit. Who was Pharaoh Na-ta-wah? Was it for him that the Gympie Pyramid was built? And what of the tunnel? Did it lead to a burial chamber? We may never learn all the answers to this mystery, for not only was a railway line allowed to be constructed along the western base of the pyramid, but a housing development now covers its northern, eastern and southern sides! The evidence is that, the Gympie colony and its population became so large that it warranted the establishment of a local ruling class. This was the case with other large colonies established at Sarina, North Queensland, in the New England district and also at Brisbane Waters on the Central Coast of NSW, north of Sydney near the Hawkesbury River. 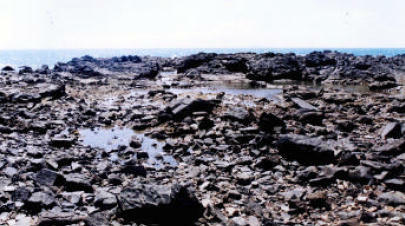 Our researches around Sarina harbour, near Mackay, North Queensland, have identified extensive megalithic ruins, including a stone wharf and nearby pre-European age open-cut gold, copper, tin, silver, iron and other mining operations, as the work of Phoenician colonists, who settled the district in biblical times. The fact that iron was mined hereabouts places the colony’s age as late as the Iron Age, around 1400 BC. There are also the wel lpreserved remains of a small temple, an ancient cemetery, and the apparent remains of an ancient 4 -5 square acres barley field, with grid patterns still visible amid its dense rainforest covering. 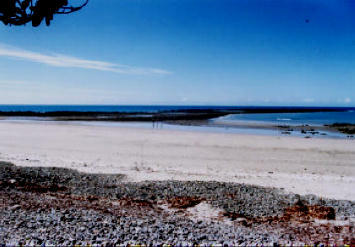 Heather and I commenced a preliminary inspection of the district in September 2000, beginning with a massive wharf composed of rocks and minerals of considerable variety, many of which had been transported to the site from beyond the Sarina district, including offshore Great Barrier Reef Islands, which had been mined for their deposits of copper, gold and other precious metals. The wharf, which is 6 m in height by 800 m in length by 30 m width, parallels surviving Phoenician examples in Lebanon, the stones having been set in slag cement. Here triremes would have brought ores from the offshore islands and other mainland mining sites to the north and south of Sarina, which after sorting were processed in at least two large stone smelters, whose remains now lie partially submerged on the harbour foreshores. The precious metals would then have been loaded into triremes for the voyage back to the Red Sea, from where, we assume, overland caravans carried them to Egypt and other fabled Mediterranean lands. View of the far end of the Sarina “Phoenician Wharf”. The wharf is covered in ore chips and minerals, identified as Copper, Tin, Silver, Gold, Quartz, Calcite, Cinnabar, Lapis Lazuli and others. Hereabouts I found fragments of thin bronze sheeting turned green with age, and which had been produced from tin and copper smelted locally. Heather and I inspected three open-cut mines excavated through solid basalt by unknown means, from which mercury and gold were extracted. Fine gold dust coating the cliffsides sparkled in the morning sunlight. 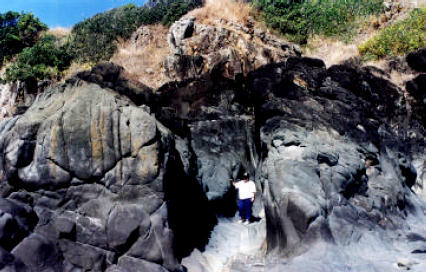 Stretching out beyond the shore was a man-made headland leading to a rocky outcrop showing signs of ancient mining. Hereabouts lay ore fragments and samples of Lapis Lazuli. At the temple, mentioned previously I found two small Phoenician glyphs stating, “Guard this enclosure”. Possibly it was built for the worship of either the Celtic Bel or Phoenician Baal Sun-Gods, but a further identifying inscription is needed for a positive identification. The ancient cemetery contains at least 60 graves, but like the barley field, there must have been many more, due to the enormous population that had to have occupied this colony. when this precious metal was discovered by the Hittites. Thus the colony surely existed for a considerable period of time. We suggest up to 2,000 years. Just prior to our Sarina investigation, Heather and I visited Bowen, further north up the coast, in search of similar evidence. At one particular beach, half buried in sandy soil high up on the shoreline, I uncovered a curiously shaped slab of yellowish sandstone, which turned out to be the carved profile of a human head, with left ear, eye, nose and mouth. Above the eye and nose ridge were five unmistakable Phoenician glyphs. Nearby on the waterfront I also found a rock shoal bearing further large, deeply cut Phoenician glyphs. Heather Gilroy examining one of the Sarina Bronze Age waterfront gold mines. The open-cut operation was made through solid basalt. How did the ancient miners do it?